President Temer probably can cling to his job despite corruption charges leveled by the country’s top prosecutor. His focus on survival, however, is apt to sap life from much-needed efforts at fiscal restraint. Semi-paralysis will be the state of play until 2018 elections. Brazilian President Michel Temer reacts during a credentials presentation ceremony for several new top diplomats at Planalto Palace in Brasilia, Brazil June 26, 2017. 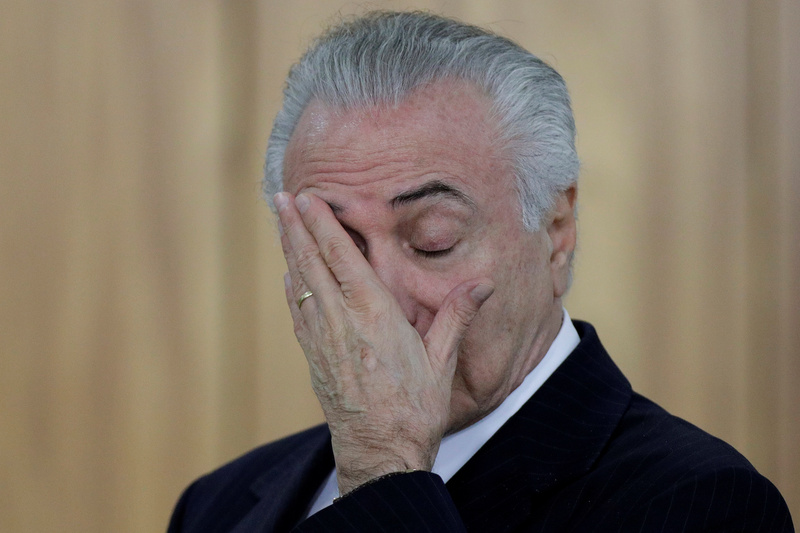 Brazil's top federal prosecutor charged President Michel Temer on June 26 with taking multimillion-dollar bribes, forcing the country's lower house of Congress to vote on whether to allow the Supreme Court to try him. Rodrigo Janot said Temer had "fooled Brazilian citizens" and owed the nation millions in compensation. In recent years, investigators have uncovered sweeping corruption across Brazil's government and industry, much of it centered on graft at state-run enterprises in exchange for lucrative contracts. Temer's office and his attorney, Antonio Mariz, declined to comment to Reuters on the charges. Temer has repeatedly said he is innocent of any wrongdoing. Brazil's Bovespa stock index was broadly flat in midday trading on June 27, while the real currency was around 0.5 percent weaker against the dollar.